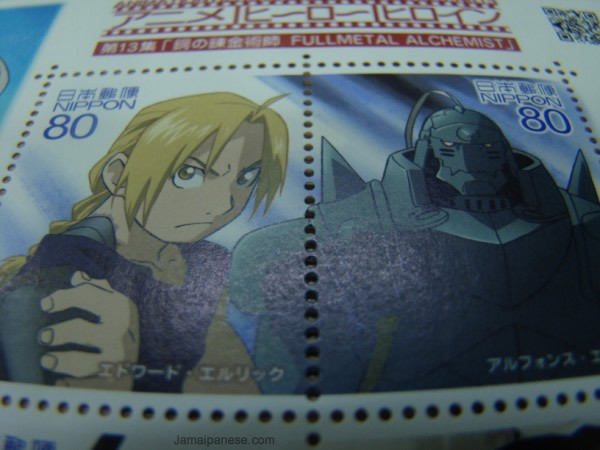 HomeallFullmetal Alchemist Postage Stamp Giveaway! 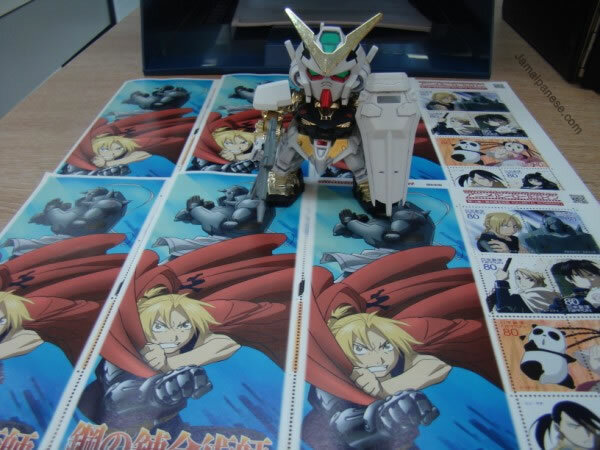 The people who run the Japanese postal System are obviously cool people and from time to time they issue limited edition stamps that not only feature boring things like flowers, shrines and antique statues but also uber awesome things like anime that would make fans world wide scream for the opportunity to collect them! There are very few tweets that make my geeky heart skip a beat but just over 2 months ago I saw one and I have had a few sleepless nights dreaming about it – Until naow! 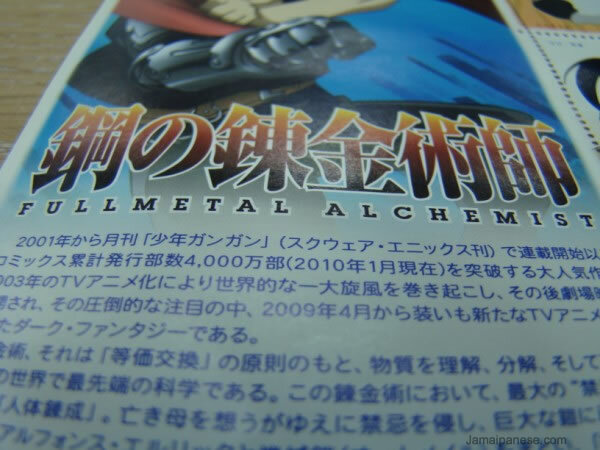 Fan of Fullmetal Alchemist? Stamp collector? Crazy about all things Japanese? 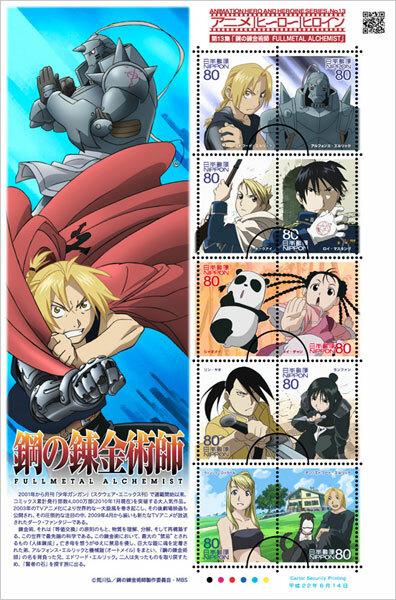 If you are any or all of these things (like me) then you should be rejoice because for the next 12 days you have a chance of winning 1 of 5 sheets of stamps featuring characters from the awesome Fullmetal Alchemist: Brotherhood! 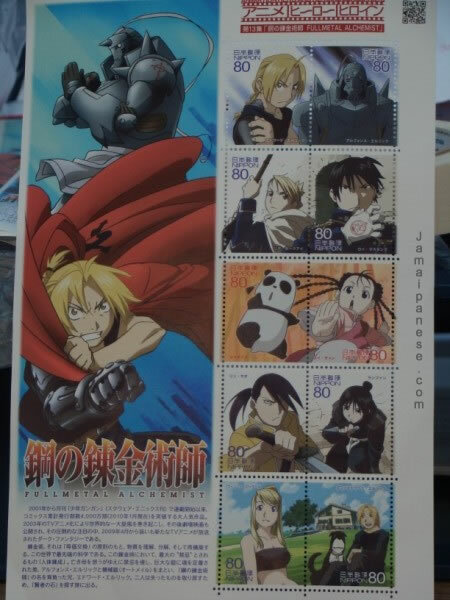 With the help of a couple of my secret agents posted in Japan I have acquired 5 sheets of a limited edition special issue Full Metal Alchemist: Brotherhood stamps. Five different lucky readers of this post can win one by entering via one of or all of the methods below. Like previous contests I have hosted on this blog entering is super easy. I have made it even easier this time because I want to be thought of as a cool guy ^-^. There are 5 ways to enter, each way gives you one way to win, enter via all the methods to maximize your chance to win! Only 1.3 million sheets of these stamps have been printed own 0.0004% of them! Join me live via my Ustream Channel on Sunday Oct 3rd 2010 at 12:30pm (GMT -5) when I draw the winners, just watching gives you a chance to win! Hope you will enter and if you have any questions feel free to contact me. Winners will be contacted directly and the stamps sent out via snail mail from my secret hideout in Kingston Jamaica. Good Luck! 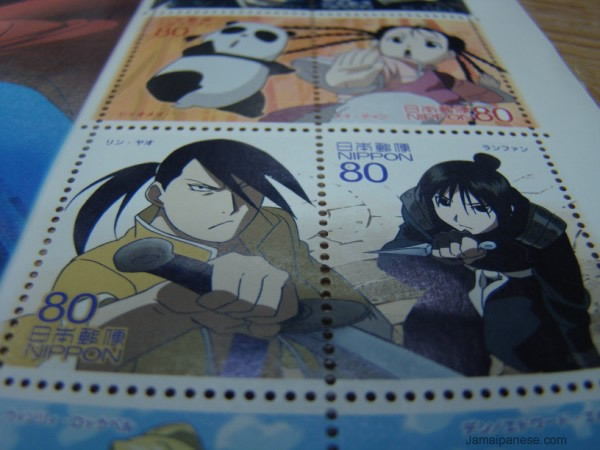 More photos of the stamps below and read my Fullmetal Alchemist Brotherhood anime review. sweet, good luck in studying Japanese and hope you win one! 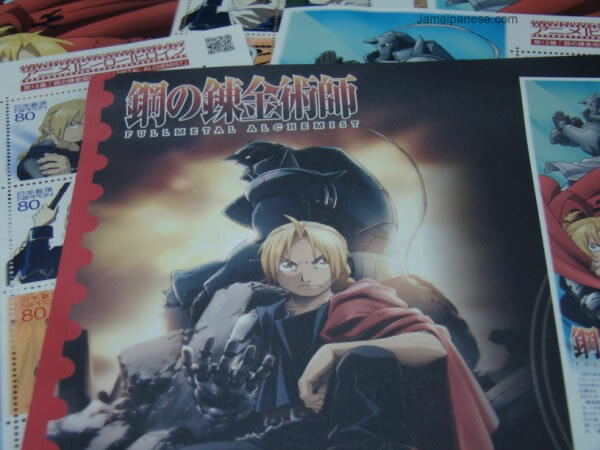 And because it would be my first anime-related collectible! ooh my, I am so scared, I have a slew of Gundams to defend me :P Good luck though! ‘Nuff said. Thanks for the opportunity and spreading the Brotherly love! excellent story of friendship, good luck! Who wouldn’t want to win this? I want them so I can stare at them and pretend I’m in Japan… instead of Ohio. 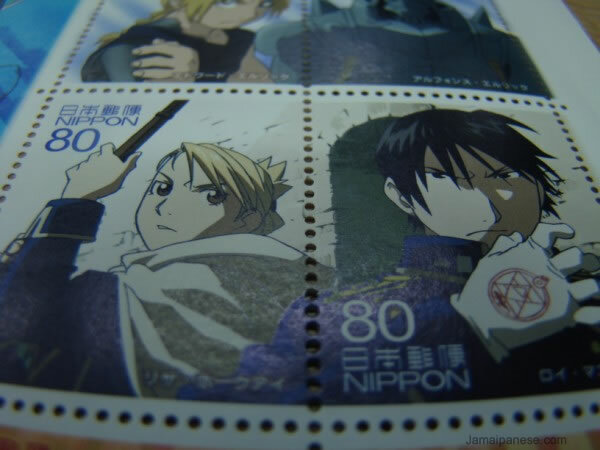 Also, I already have some stamps from my other favorite country ever (Ireland), so I definitely need some from Japan. 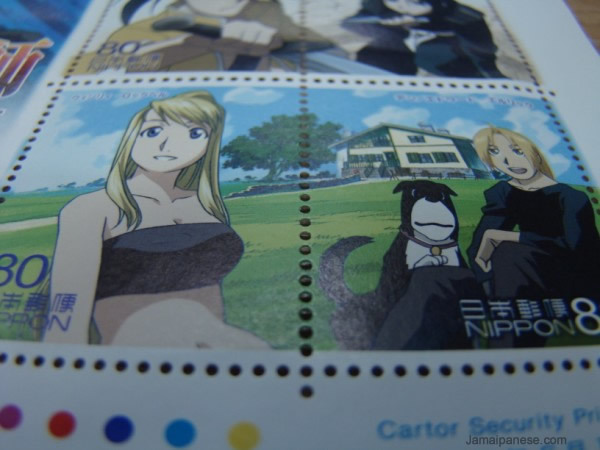 Plus, there’s one of Riza Hawkeye and I think she’s awesome. I would like to this for my nephew who is into Alchemist. Thank you for the giveaway! I’d like to win because, my son is collecting stamps for his enjoyment and a boy scout merit badge. 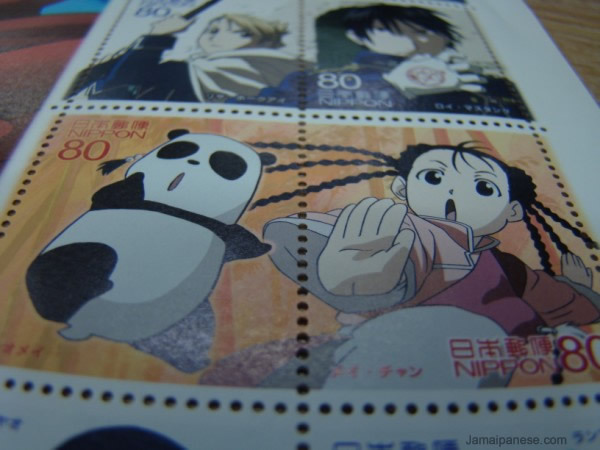 A good reason I should be a winner of one of these stamp Stamps is because my daughter loves everything Japanes.